Ah, how to buy wine? Buying wine can be a scary proposition, though I am not sure why. Is it that we feel unsure? Bewildered by the sheer number of choices? Are we afraid to look foolish? Why is it different than buying a shirt? One you learn the ins and outs of how to buy wine, it will be fun.. The first thing to do is to remember that any store should be happy to get your money, so do not let anyone make you feel intimidated. There are several ways to approach this activity. One way is to buy what you have tasted before and liked. Though that may be a little too predictable. Another approach may be to read a food and wine magazine for information and suggestions. Most magazines, as well as articles in your local newspaper, will have a list of recommendations, including a wine rating for each bottle. A wine shop is an ideal place to buy, since you will find knowledgeable sales people, and a high turn-over of inventory. You don't have to go to a huge store, a smaller, friendlier, shop may be just what you need. In our neighborhood we have a small food store, with a surprisingly large wine department. They also employ a gentleman who is always ready to answer any questions and offer suggestions. I like to go up to him and ask him for a recommendation. I tell him that I am looking for a red wine, I may be a bit more specific and say that I want a Pinot Noir, or that I want to pair it with a particular dish. I always mention the price range. I have no problem saying "I am looking for a Syrah in the 15 to 20 dollar range." I say it with conviction. I don't feel that I have to spend $80.00 dollars for a bottle of wine just so that the wine merchant will think better of me! If you are shopping in your regular supermarket, you probably won't find anyone who is terribly knowledgeable, though you never know (hey, look at my neighborhood food store with the friendly gent). Another option, though a risky one, is to attend a Wine Auction. Though you may not want to buy the first few times that you attend, it is a great way to get a wine education, and to learn about prices and trends. But remember to be disciplined, and resist the bidding temptation until you learn the ropes. The best thing to do is to ask a friend for advise, or simply buy something that sounds interesting. This is not rocket science, you have nothing to lose. The worst thing that can happen is that $15 dollars will buy you a boring wine; then again, you could have a very pleasant experience. Even if it is not, you will have learned that you don't like that particular wine, and you will never buy it again. Another place to buy wine is on the Internet. Read about the ins and outs of buying wine online. If you go a little crazy and buy a quantity of bottles, your next challenge will be storing wine. 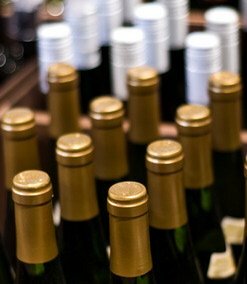 click here to learn more about wine storing. Then You Won't Just Learn How to Buy Wine, You Will Be Embarking In a Great Adventure!